Anemometers or wind speed meters are terrific tools for teaching science to kids because they are easy to understand even from young ages. Everyone who has experience windy days and less windy days is familiar with the concept of fast wind vs a slow breeze no matter their age. And, it stands to reason, that there ought to be a way to measure the speed of wind, right? By equipping a young person with an anemometer they’re in the driver’s seat to answer that question themselves. Science can often be abstract but with an anemometer kids can experience it in a hands on way. In this article we’re going to be suggesting some of the best anemometer kits for kids as well as exploring some related topics like making an anemometer themselves. If you’re only interested in our recommendations, you can skip straight down to the recommended products section. What is an anemometer for kids? How does an anemometer work for kids? Different wind speed meters (“anemometers”) work differently. The most simple type of anemometer is a rotating cup anemometer which works pretty much how you’d expect. It typically features two or three or four wind cups and it spins in the direction that the wind is blowing. By counting the number of rotations in, say, a minute, we can calculate the speed of the wind. Other anemometers use wind blades inside a fan type enclosure (these are often called vane anemometers). Still other anemometers measure the speed of the wind by calculating how long it takes to cool down a heated wire (unsurprisingly these are called hot wire anemometers). Another advanced type of anemometer is an ultrasonic anemometer which measures how fast sound pulses move through air. A wind sock isn’t quite an anemometer but it is another simple method of roughly measuring wind speed and direction. Making a do-it-yourself cup anemometer is a great science activity for kids. You can even create a simple but functional anemometer out of common household items like a pencil, straws, a pin and paper dixie cups. Watch the following how-to video or read our comprehensive guide How to make a cup anemometer for kids (DIY paper cup anemometer) – Video. 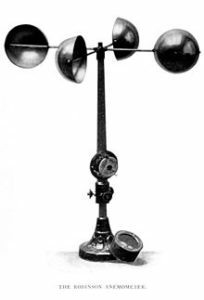 What are the best kids anemometers? If you’re looking for a basic anemometer kids will understand, this is it. It consists of four wind cups which are mounted on a stem that spins in the wind. The faster the wind blows, the faster the cups rotate. One of the wind cups is red which makes it easier to count as it spins (the number of rotations per minute will allow you to calculate the wind speed). This is a great science classroom anemometer or for home use if you don’t want to make your own anemometer out of paper cups. This is a basic handheld wind cup kids anemometer. As the wind gets faster, the spinning cups start to rise, which elevates the reading bar on the stem of the device. It won’t produce very exact results of course but it’s a simple anemometer for kids that doesn’t require the user to count the number of revolutions per minute, instead relying on the built-in wind speed gauge. This cup anemometer also does not require batteries — another plus. This bright yellow battery powered vane anemometer features a simple, easy to read screen that measures wind speed in a variety of units (miles per hour, knots, feet per minute, meters per second, kilometers per hour). It also has a handy wrist strap and options for displaying the current wind speed, average wind speed, and peak wind speeds. This anemometer for kids even has a built in thermometer too. The backlit screen allows it to be used at night. Powered by a single CR2032 “coin style” battery (included and replacable). This anemometer is great for sailing, kite flying and more. What are the pros and cons of building an anemometer with kids vs using a pre-assembled anemometer kit? DIY cup anemometer projects where you build anemometers out of paper cups can be a great project that involves kids directly in the building process. At the same time, they won’t be terribly accurate and it may be hard to know how to translate the number of cup rotations per minute into the speed of wind in miles per hour or other units of measurement. What is the right age to start using anemometers with kids? The youngest age recomended by a product in this article is 7 years old for the toy weather kits. However to make paper cup anemometers the minimum suggested age is 8 or 9 years old (third or fourth grade). There is no maximum age for anemomters although the complexity of the work you can do with it depends on age. Anemometers are used in middle school projects commonly. What can a child or student learn from using an anemometer?